This version is different than the one I played before, this time I got a perfect snake and didn't crash and burn the game. 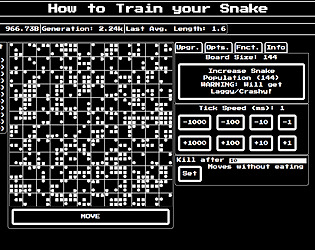 :P The auto clicker feature is awesome, watching all them snakes go! 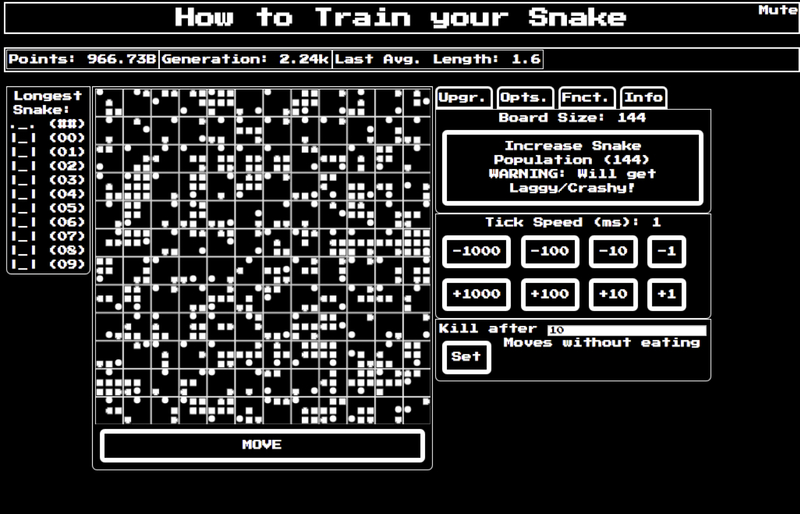 What would be awesome is to somehow visualize the neural network so as your snake are learning you can watch it grow. Really good concept, and the execution is solid in terms of game jam. Good stuff. Nice concept! The "gameplay" ends quickly but the implementation around neural networks is great! Wow really interesting concept, This actually can be scaled into a fully fledged game, hope you continue with the development. It got me interested in Neural networks. Good job!